of Capri, with the Faraglioni Rocks of Capri in the distance. The Bay of Jeranto (also Ieranto) Nature Preserve (photo, right) is one of the most remarkable bits of natural beauty in the Campania region of Italy. The bay is part of the Protected Marine Reserve of Punta Campanella and is in the comune (municipality) of Massa Lubrense at the end of the Sorrentine peninsula. (Massa Lubrense is also the name of the main town in the comune; the town is called 'Massa,' for short.) The comune of Massa Lubrnese occupies the entire tip of the peninsula, thus being bounded on the sea by two gulfs (Naples and Salerno) and on land only by the comune of Sorrento as one moves back along the peninsula towards Naples. The bay of Jeranto is actually in the Gulf of Salerno and not Naples since it is just to the east of and past the tip of the peninsula, Cape Campanella, the geographical feature that divides the two gulfs. 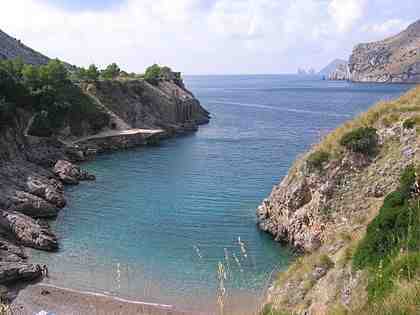 The bay opens to the southwest with a line of sight past the cape to the Faraglioni rocks off the isle of Capri 5 km (3 miles) across the straits. Forty-nine hectares (120 acres) of the land on the bay, is now owned by the Fondo Ambiente Italiano (Italian Environmental Fund). The bay is part of the village of Nerano, one of 14 small centers within the comune (municipality) of Massa Lubrense. 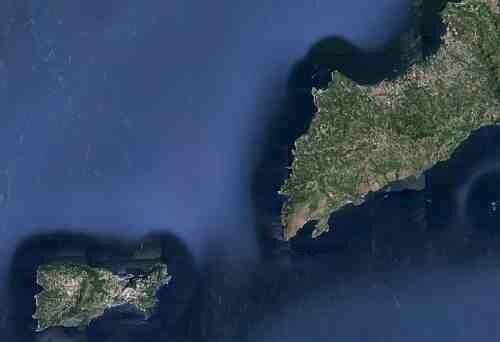 This is the area of the sirens of Greek mythology; classical sources speak of the Greek temple to Athena and, later, of the Roman temple to Minerva built on the same site. In general, bits and pieces of ancient Rome abound in the area; also, inscriptions in the Oscan language (the language of the Samnites, grand enemies of the Romans) were discovered in 1985. As well, there are some Saracen Towers built during the period of the Spanish vice-realm (1516-1707). Rural architecture includes the old “colonial houses” (that is, the main buildings on property worked by tenant farmers but owned by absentee landlords); they are now environmentally protected buildings. The general terrain around the Bay of Jeranto is one of terraced olive groves; the natural flora is typically Mediterranean “macchia”) (or Maquis shrubland), typical of much of the coast. The area is a major route of migratory birds, and more than 100 species have been counted, including those native to the area. Oceanographically, Jeranto bay is at the confluence of waters from the bay of Naples and the bay of Salerno to the south; upwelling in the waters is an important part of the circulation and exchange of waters in the straits between the peninsula and the island of Capri and is vital to replenishing nutrients for the aquatic plant and animal life. The bay is accessible from above, at the village of Nerano. It is best seen, perhaps, from the sea, where you can view geological features such as the caves and grottoes along the rock face at sea level, not visible from the land. The area of the bay of Jeranto has been home to writers, artists and kings. It inspires poetry, as in these lines from my neighbor and friend, Giacomo Garzya, whose forthcoming collection of verses, Campania Felix, will appear in the near future in the original Italian, accompanied by my English translations. the colors always change, like the clear sky and the clouds. What endless shapes they form! The everlasting return of the living and the dead. note: Other poetry by Garzya here , here and here. Also see a delightful story, The Bay of Ieranto and the Unexpected Gift, on the website of Napoli Underground at this link.